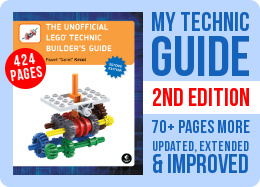 A table listing ratios for the most popular Lego gear wheels, optimized for print, is now available for download. When building with Lego pieces, I like to be free of looking stuff up using my computer. Over time, this habit has prompted me to create a number of handy printouts with useful data that I could simply keep above my workshop and refer to when necessary. 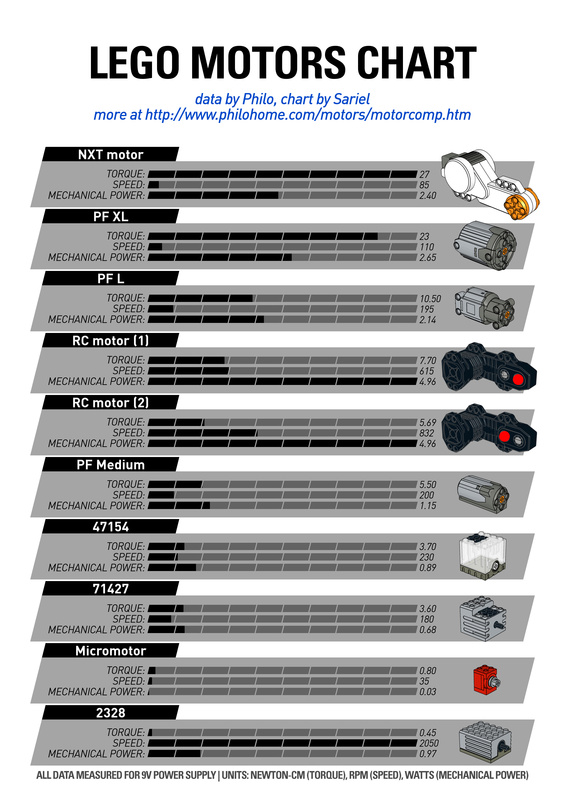 One of them was a table of ratios of the most popular Lego gear wheels, which I have now optimized for easy printing and I’m sharing it with you. Note that the table is available as a PDF file ready to print on a single A4 paper sheet, which you can download right here. 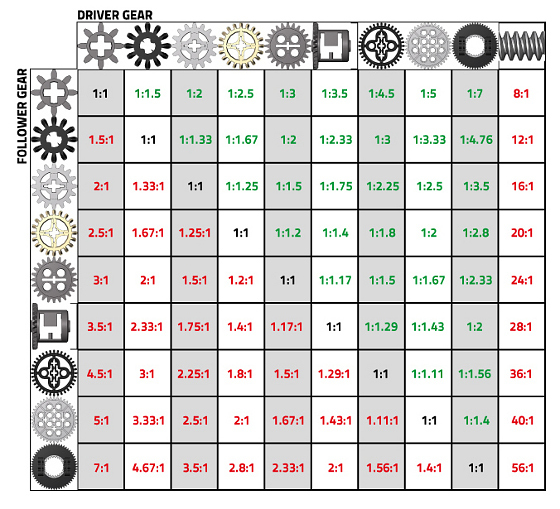 For clarity, the table includes just 10 various gear wheels, which should be sufficient in most cases. I have simply omitted all redundant data, such as different variants of the 16t gear wheel and 24t gear wheel, I have omitted single bevel 12t gear wheel because it has the same ratios as double bevel 12t gear wheel, and so on. The 14t gear wheel was omitted completely because it’s an obsolete gear that has really little use today. I have also included only one differential, because out of the two remaining ones one is identical (same number of teeth) and the other has two sides, one equal to 16t gear wheel and the other to 24t gear wheel. I have omitted small Technic turntable because it has the same number of teeth as the differential (28), and I’ve included only studless large Technic turntable because the studfull one has the same number of teeth. The new, 60t large Technic turntable was omitted to avoid confusion between the two similar turntables, but I may add it in the future. In the table, green marks ratios that produce acceleration (more speed, less torque) while red marks ratios that produce reduction (less speed, more torque). In order to use the table, select your driven gear from the upper row, then select your follower gear from the left column and see where they cross. The value in the field where they cross is your gear ratio written driver:follower. 1:2 means one rotation of the driver gear causes two rotations of the follower gear. This is acceleration – the speed is increased 2 times, the torque is decreased 2 times. You get double speed but half of the torque. 2:1 means two rotations of the driver gear cause one rotation of the follower gear. This is reduction – the speed is decreased 2 times, the torque is increased 2 times. You get half of the speed but double torque. Note that the worm gear is missing from the followers column because it can only work as a driver gear. Also, some combinations of the gears presented in this table are impossible, but the ratios are shown anyway just for your information. Also don’t forget that you can visit gears.sariel.pl for a complete online gear ratio calculator, and that there’s my old gear wheels tutorial for further reference. I like both and I will review 42043 B this quarter. Hi tell me do like A or B model of 42052? And when will you review the 42043 b model ? I’ve used 56t studless turntable, which isn’t the newest one. If you want numbers of teeth, just look at ratios in the worm gear column. I really like this table, thanks!